Comment on this post telling us where this hammock is – please be as accurate as possible – the closer you get to the actual location the better chance you will have to win. The winner will receive a gift certificate worth 50% off any hammock we sell. For an additional chance to win go to our facebook page and like this picture and leave your answer there as well. Hint: You will find the answer on our website. Remember, this is a camping hammock. Contest Deadline is June 16 2011 (just in time for Father’s Day). 2. You must leave an email so we can contact the winner. We will not share or use your email address in any other way. Only 1 entry per email address. Do not leave your email on our Facebook page..
4 The gift certificate is for 50% off the purchase of ONE hammock. Shipping, hammock accessories, etc., are not included in this discount. 5. The winner will be determined by random number selection from the correct answers. 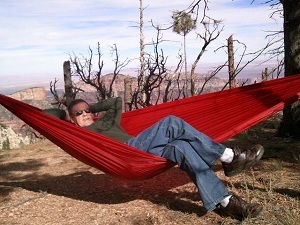 It looks as though this Hammock is at the Grand Canyon (an absolutely incredible place to see/camp). How about Grand Canyon National Park? LOL 1 more time, North Rim Picnic Area! Can you tell I want to win, I want to get Dave one for Father’s Day! I Believe your Hammock ison Peddys head R.D. Route 333, I see and Island that looks like a place I grew up at. Hi there.. Could it be at the North Rim picnic area by the Grand Canyon in Arizona?